At the moment, there is one primer and one foundation available but hopefully in the future more will be added for specific skin types and concerns. The Complexion Perfection primer is quite thick in texture - half way between a lotion and a cream and it feels so nourishing on the skin. It is perfect for my dry skin but I'm unsure how those with oily skin would feel about it. That being said, it doesn't sit on the skin, it absorbs to provide a velvet base for foundation. Given the texture of the #FauxFilter Foundation, it is the perfect base and I don't know think the foundation would work very well on my skin without this rich primer. It is lightly scented of roses but this dissipates so don't let that put you off if you don't like that scent. I only need a small amount to cover my face as it's quite pliable despite the thick-ish texture so this tube should last quite a while. I like that it's in a tube so I'll be able to squeeze out every last drop and it also has a pump. £27 for 30ml. Regular readers will know that I am all about a glowy base but I had to order #FauxFilter Foundation as soon as it was released because there is no doubting that Huda's base always looks perfect and I figured that I could set with a glow spray if I needed to. I like the packaging - it looks like glass, but is actually sturdy plastic, which is perfect for travelling or just in your makeup bag for on the go. I like the bottle - square with a black lid and black ombre effect at the bottom and, of course, the Huda Beauty logo on the side. It also comes with a pump - very important tick right there! Before I get on to the product itself, it's important to note that whilst there are 30 shades, in my experience, they are lighter than they appear in the swatch photo on site and they don't oxidise, so you need to choose quite carefully. Each foundation also has a sample of the primer in the box, which is brilliant for those who only want to buy the foundation initially. The texture is thick and a dense brush is required to really buff this into the skin - I didn't find that my beloved Beauty Blender worked as well as a brush with this - I can finish with the BB but a brush is definitely needed to buff it into the skin. I wouldn't say that the Face, Buff and Blend brush is absolutely necessary if you already own a dense brush, however if you usually use a stippling brush or Beauty Blender, then I would recommend buying it. The coverage is full and whilst I wouldn't say it feels particularly heavy on the skin, it definitely couldn't be described as lightweight. The finish is matte but not flat matte, much to my relief and combined with the primer, this foundation makes the skin look poreless. It literally glides over imperfections to leave a smooth, even base and it doesn't cling to dry patches or settle into fine lines. Because I have dry skin, I don't feel the need to set it but those with combination or oily skin might. It is an extremely long-wearing foundation - the longest I have worn it for was 10 hours and it literally hadn't budged at all on me. 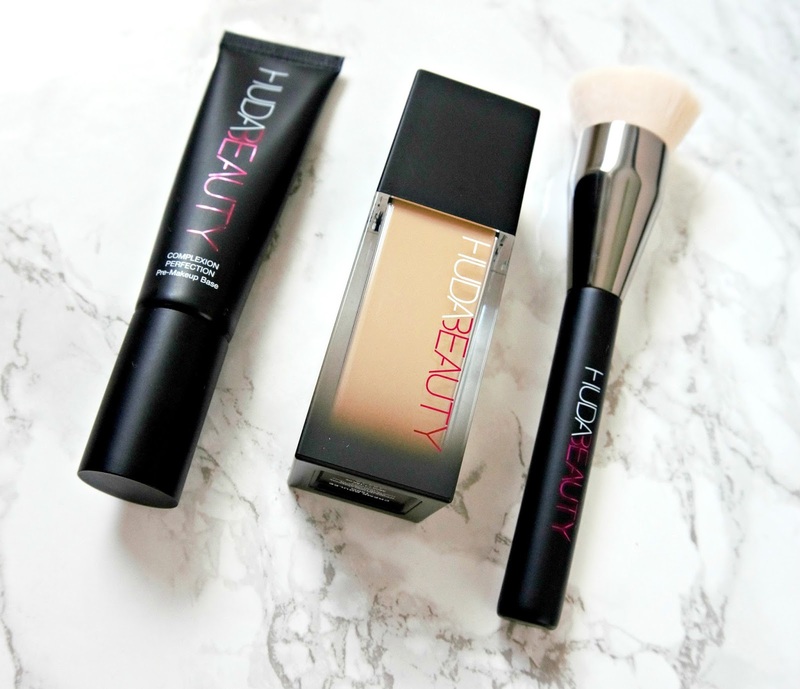 It is not a foundation that I would wear on a daily basis, purely because I don't need full coverage every day, however if you are out of the house for long days then this is the foundation for you. £32 for 35ml. I must admit that when the 3D Highlight palettes were released, I overlooked them because I already own around 50 highlighters but more recently, I took a closer look and realised that they weren't just "another highlighter palette" because of the range of products inside. There are two different shades of palette available: Pink Sands and Golden Sands, which is what I have. The packaging is heavy cardboard with a plastic sleeve - slimline but sturdy and I recently travelled with it without a problem. Inside are four large products (34g in total) - one cream and three powders and due to the texture of the powder, I haven't experienced any crossover between the two formulas. The cream product (Fiji) is applied as a highlighting base or I guess you could wear it alone if that's your preference. It is a golden colur and is a very smooth cream product that doesn't make the skin looks greasy but it adds a sheen for a lit from within look. Seychelles (light gold in colour) is a very subtle highlighter when worn alone but when layered over Fiji, the result is beautiful. There isn't even a hint of glitter here - this is a very sophisticated highlight that even mature skins could wear. 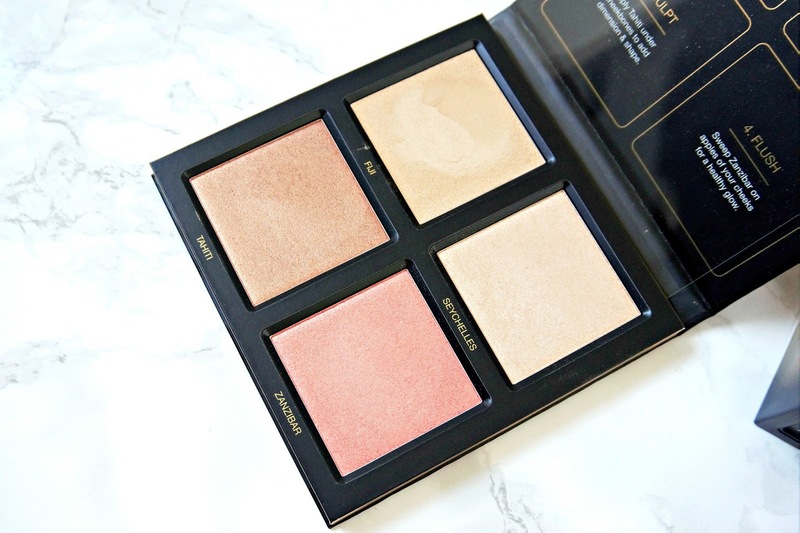 Tahiti is a bronzer that can be worn to add some definition to the face but I wouldn't say it is a contour powder as it has some subtle shimmer - I have also used it on my lids and it worked well with my green eyes. Finally, there is Zanzibar, which is a flattering peachy-pink blush that has a subtle golden undertone that ties all four products together on the face. Huda's first eyeshadow palette release was the Textured Shadows Palette - Rose Gold Edition, but I skipped that because it was released around the same time as the Modern Renaissance palette, which I already owned. However when I saw her follow up palette - Desert Dusk, I snapped it up! I have reviewed it in full here, but if you haven't read that, the summary is that the duo-chrome and shimmer shadows in this palette are as good as it gets - buttery soft, pigmented, easy to apply and blend and are long-wearing. The mattes are not quite as buttery but they apply and blend well without causing too much kickback in the pan. The glitter shade is the only one to disappoint me but I don't own a glitter glue so I do reserve judgement on that one. £56 for 25.2 g of product. I know that some people will balk at the idea of spending £56 on an eyeshadow palette so I was delighted when I saw that some mini palettes were being released for less than half the price but with 9 shadows so you can get a good feel for the range, moreso than with a quad. There are four colour ways in this range: Mauve Obsessions, Electric Obsessions, Smokey Obsessions and Warm Brown Obsessions, which is what I have. My worry with these palettes initially was that the quality might not be as good as in the main palettes as is often the case with some brands, but as soon as I swatched the shadows, I knew that wasn't the case. The palette itself is "mini" as the name suggests and fits in the palm of my hand but inside is a mirror the size of the lid and nine decent sized shadows and thankfully no brush as that would just waste space. This will take up very little room in your handbag or makeup bag so would be ideal to take you from day to night in the office. It is worth noting that the matte shadows in this palette have talc listed at the top of the ingredient list whereas in the Desert Dusk palette, there is no mention of talc. However mica and dimethicone are listed straight after, therefore these are not chalky mattes like the ones we all dreaded using back in the day. There are 8 mattes shades and one metallic, in a range of burgundy, copper, beige and brown shades with the metallic being a beautiful copper. They are all pigmented, they apply and blend really well and don't fade or crease on me (I always wear a lid primer as I have oily lids). 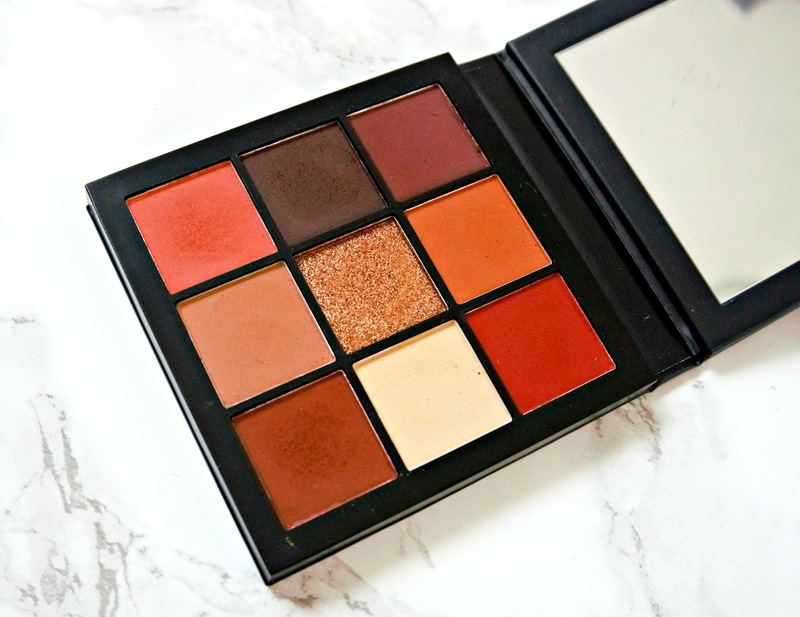 At £25, this is the perfect introduction to Huda Beauty eyeshadows and also the perfect handbag palette. Lashes were the first products that Huda Beauty released. I remember seeing Huda being interviewed and she said it was very much a family affair - her sister invested some savings and the whole family helped to package the products. I love hearing stories like this because you know it's personal and not just a big corporation. There are 10 types of lashes available, depending on how natural or glamorous you want to look and I have the Sasha lashes. 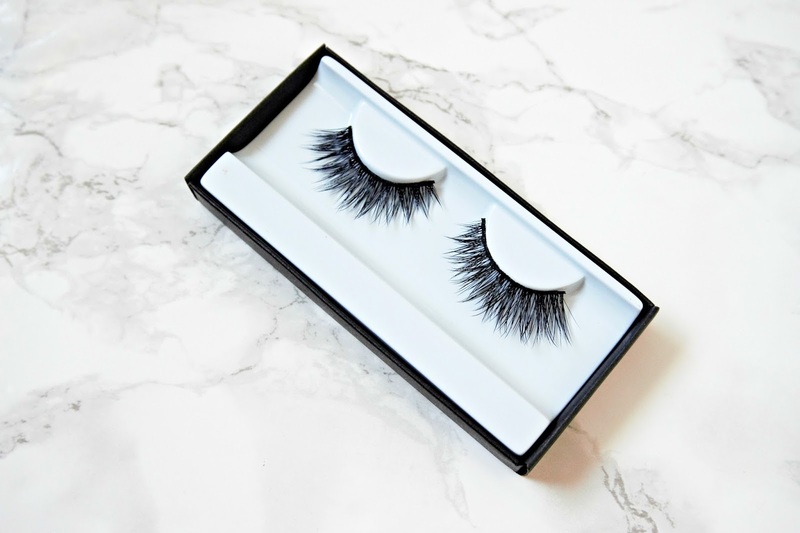 What I love about these lashes is that they are varying lengths so they add both volume and length without looking too fake and the result is very fluttery lashes that don't feel heavy on the eye. They are also quite bendy so even non lash experts, like myself, can apply them without too much fuss. Also they can be used a number of times as long as you store them carefully. They are priced at £15.50 but the glue is sold separately at £14. It may seem like a steep initial outlay but the glue will last a really long time! In terms of lip products, Huda Beauty has quite a few products available in a variety of finishes. The lip contour pencils are creamy in texture, which makes them a pleasure to use because they don't drag on the lips. I'm usually not the biggest fan of liquid lipsticks but the liquid mattes from Huda Beauty are different from any others I have tried in texture. They are very watery, which worried me initially because I thought it might be messy but the applicator allows for precise application and once they dry down, they don't budge at all. They are very comfortable on the lips - non-drying and extremely long-lasting. They also don't highlight any fine lines on the lips. Without doubt, one of the best liquid lipstick formulas I have tried. I love the lip contour sets because they contain a full size lip contour pencil and two mini liquid mattes for £29. I know metallic lips are having their moment but I never really thought that they would suit me, but the thing is I love lip gloss so when I was given the chance to try Huda Lip Strobes, I thought I'd give them a go. I chose the shade Snobby as it seemed the most wearable for me - it's a light pink shade with gold reflects, which gives a serious amount of shine! It looks very pretty on but the wear time is only around 3 hours on me. Obviously, I haven't tried tried absolutely everything from the brand but I hope I have given you a good overview of what's available. I hope that a brow product will be their next release! 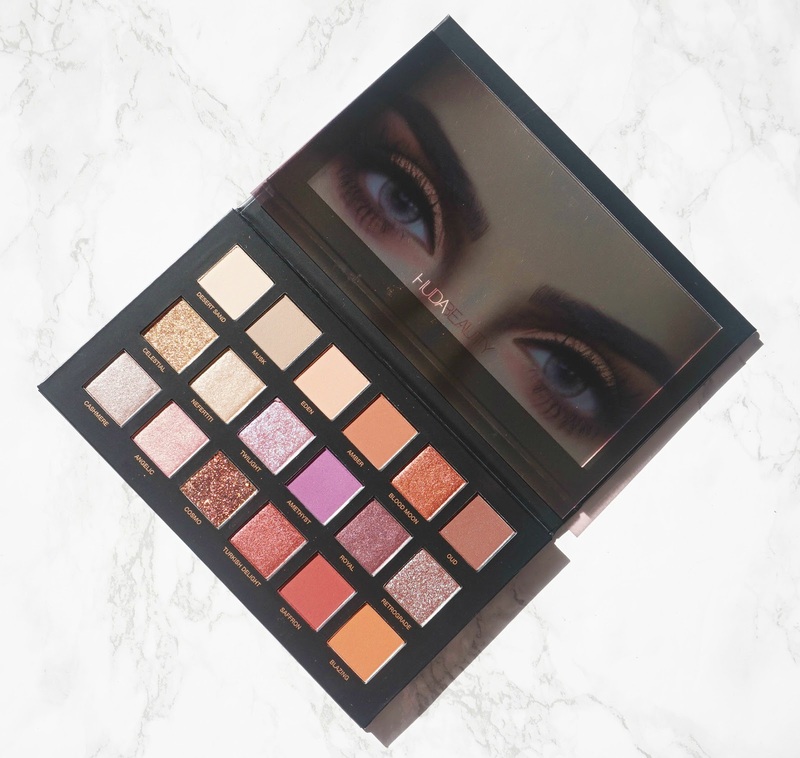 If you are interested in buying any Huda Beauty products, don't forget that there is free shipping on the brand with Cult Beauty for the month of November. 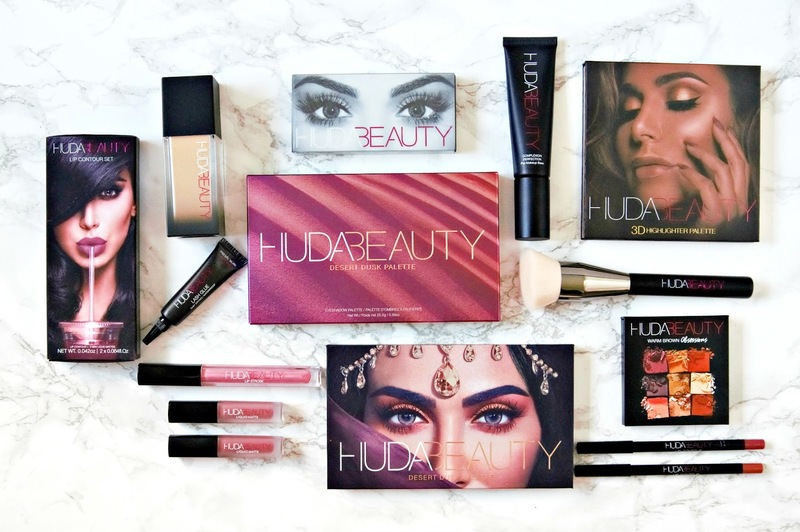 What are your favourite Huda Beauty products and thoughts on the brand in general? I'd love to hear! All products are bought by me, unless otherwise stated. I bought the Desert Dusk Palette, foundation, primer and brush myself and the other items were kindly gifted to me by Cult Beauty. Opinion is always my own.